Gina Rodriguez is a super talented and (obvi) a very beautiful woman. But who knew she was THIS trend-setting and stylish?! 2016 has definitely been the Jane the Virgin actress’ year – from the heaps of praise she’s been garnering for her leading role as Jane Villanueva on the CW hit, to the piles of award nominations and recognition she’s been getting for her groundbreaking performance. Top top it all off, Gina *always* looks like a fashion icon. But recently, on her press tour promoting her super buzzed-about new film Deepwater Horizon, she brought her style A-game to a whole new level. At TIFF, where the movie had its world premiere, she rocked a stunning long garden-inspired gown. And just yesterday, Gina debuted an adorable lacy little black dress (by Sandro), which, of course, made us run out and find a style to mimic that look ASAP. Rodriguez must be on a monochromatic kick lately, because she wore an equally stylish and adorable, lacy little white dress during a Good Morning America appearance earlier the very same day. To complement the Sandro LBD she wore just a few hours later, of course. 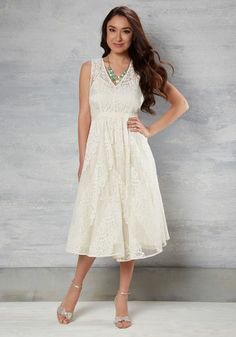 From the demure high-cut neck of the sleeveless dress to its subtle flare and gorgeous lace detailing, we seriously can’t get enough of this look, which Rodriguez paired with simple neutral heels. Gina rocks the dress as a press tour outfit, unsurprisingly, but we can’t help but think what a perfect wedding dress this would be for a casual daytime and/or summer bride. So, naturally, we scoured the Internet for a few affordable options to mimic this dreamy dress. Get it here for $98. Get it here for $11.04. Get it here for $348. Get it here for $210.